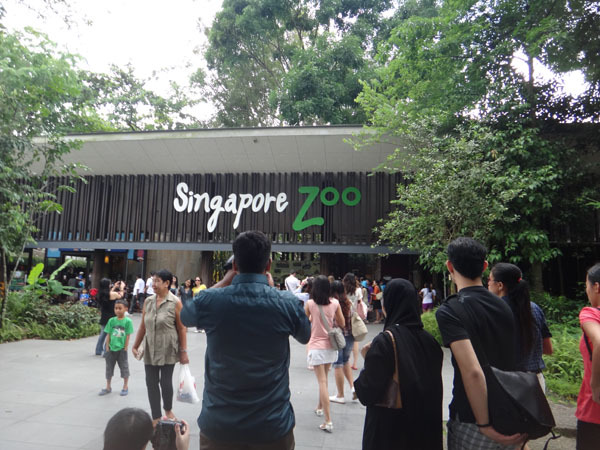 I first visited the Singapore Zoo in 1998 with my friends, and I promised myself next time I visit the zoo, it's going to be with our children. Almost 14 year later, my dreams came true:) I love how clean the Singapore zoo is and how the animals seems to be so healthy and happy. 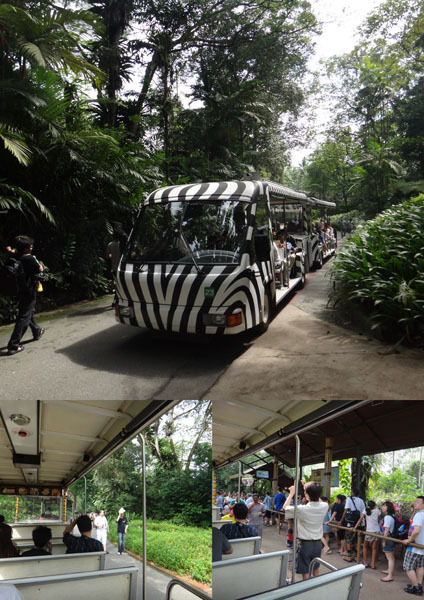 When I was making the itinerary for our family trip to singapore, I found out there is a direct bus called Singapore Attraction Express Bus from and to the zoo. One adult cost SGD 4.50, while one child cost SGD 2. We wanted to take this bus as it passes our hotel. But in the morning when we supposed to catch the bus, our kiddos request to go to the pool first before going to the zoo! Oh no..so we took MRT and bus 138 as our plan B:p We could book the ticket bus at the website of SAEX bus. But we didn't buy it as we were not sure we could catch the bus at 9 pm in the morning. We took MRT from Bugis, changed line at City Hall MRT to the red line MRT heading to Ang Mo Kio MRT station. Alighting at Ang Mo Kio, we followed the sign to "Bus Interchange" until we found the bus stand for bus 138. The bus stand of bus 138 heading to the zoo is unfortunately at the last stand. So we need to walk all the way to the bus stand from the MRT station! It was Sunday about 11 pm, the queue for the bus was very long. We had to wait about 20 minutes for the bus. Fortunately we could get on to the first bus and didn't have to wait for the other one to arrive. In took about another 30 minutes to arrive at the zoo, giving some time for the kiddos to sleep. 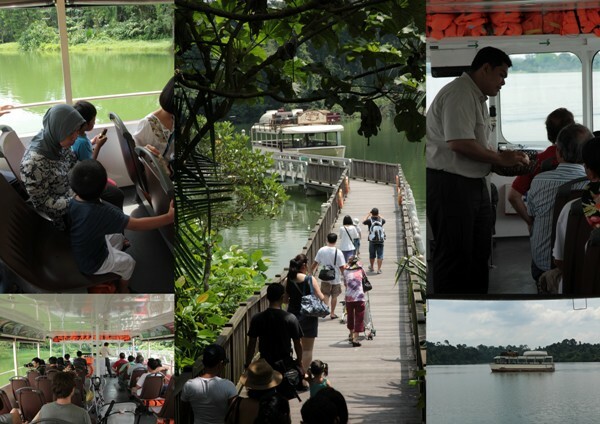 In total, it took 1,5 hours from our hotel at Bugis Village Hotel to the zoo. Phew! Arriving at the zoo almost 12 at noon, the queue to get the ticket was very long. Alhamdulillah our friend Claudius Seta has warned us about the queue and recommended us to buy the ticket online. Thanks Seta! We just walked to the gate, showed the printed tickets, and voila we were inside. We didn't buy the ticket for Arkan who is turning to 3 yo next month, but the person in charge only said "ok" when I told him that Arkan is not 3 yo yet. By the way we bought "zoo per saver" ticket with unlimited ride of tram and boat. It cost SGD 27 for adult and SGD 17 for children (up tp 12 yo). I would recommend to buy this ticket if you go with children, as we can just look around the zoo with the tram when our children are tired. 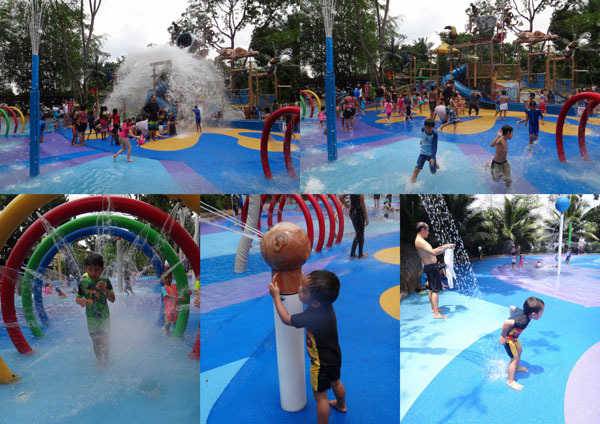 Kiddos spent about an hour playing there, and finally we were succeeded to get them out of the waterpark. Yippi.. Than we went to the toilet area, the Singapore Zoo provide shower for the kids outside toilet in the form of octopus, so funny! 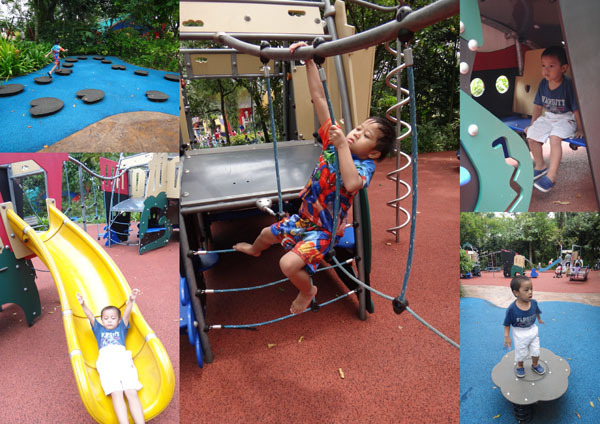 After shower and changed their clothes, our kiddos still asked to enjoy the playground located just next to the waterpark. and thereafter we went to the KFC to have our late lunch:p KFC also located at the Kids Fun World Area. KFC was really crowded, we had to queue not only for the food, but also for the seat. If I am not mistaken maybe we have spent more that 2 hours at the Kids Fun World area..wohooo.. After our lunch, we went to the tram station, and took the tram to see the elephant show. The place were full already, we didn't get any seat. 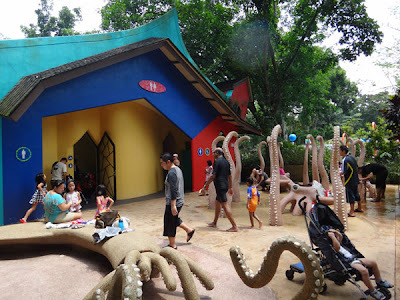 It was the only show we saw in the Singapore Zoo, we didn't manage to see other show as the kiddos were already too tired. From the last tram station, I had to take a 17 kg Arkan who fall asleep, and Rene had to take a 22 kg Najmi who was also really sleepy:p When we proceed to the bus stop, we were so happy to see the SAEX bus heading to the Beach Road! Wohoo perfect! So we didn't have to take bus 138 and MRT with the sleeping kiddos. We paid the bus SGD 11, and asked the driver to inform us when he reach Bugis Village Hotel. The bus was very fast compared taking MRT and bus 138, another 40 minutes, we arrived at the hotel already! So, I strongly recommend you to take this bus if you plan to go the zoo. The kids were tired but really happy. 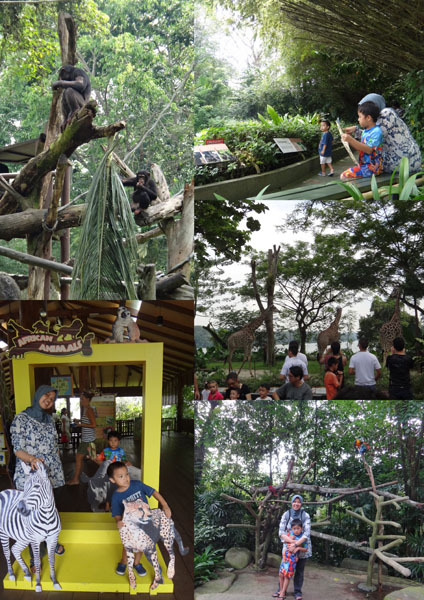 Until now, Arkan still remember what the elephant did in the show, and share the stories to grandmas, grandpas and also his cousins:) Next time if we go to Singapore with kids, the Singapore Zoo will always be in our itinerary. Follow our twitter & instagram: @tesyasblog. Like our FB Fanpage: Tesyasblog. mba tesya, tiket SAEX bisa beli di atas bus atau di tiap bus stop ada ticket booth nya. atau mesti online booking? Saya jg mau ke singzoo bulan Mei 2014. Saya dan suami bawa baby 1,10 bulan. Hai Leslie, bus SAEX ini enggak ada bus stop nya, Kita tunggu aja di depan lobby hotel yang dia lewati. Ticket nya dbeli di atas bus ke supir. Siapin uang pas aja, takutnya dia enggak ada kembalian. Asyik mau ke Zoo, have fun ya..
saya dah booking di strand hotel bencoolen mba, krn kamarnya luas dan deket ke perhentian saex. kl ga salah dia berhenti di rendezvous hotel, kl liat di peta sih ada di belakang strand hotel. bener ga mba? Hai Leslie, sebetulnya kita ga usah inep di hotel yg dilewatin bus SAEX, kita cuma perlu dtg ke depan lobby hotel tsb pada jam sesuai jadwal bus. Misalkan kamu inep di Fragrance Emerald, sekitar jam 8 pagi dari bus stop dekat hotel (nama bus stop: Opp Moh Shalleh Mosque), naik bus nomor 80. Turun di bus stop Parkview SQ, dekat dengan Landmark Village Hotel. Bus SAEX akan ada di depan lobby hotel jam 09.05. Btw, bus SAEX nya putih polos, di deket pintu masuk ada tulisan "SAEX Bus to the zoo" Karena kalau nanya petugas hotel, mereka selalu pikir kita naik bus yang dicat belang-belang kaya Zebra. Padahal bus tsb untuk yg ikut tour. Sementara SAEX bus putih polos. Di dekat hotel Fragrance Emerald ada tempat makan India yg halal. Kamu jalan aja ke arah hotel Fragrance Saphire, nanti resto India itu ada di sebelah kananmu. mba tesya, bisa ga aku minta cp or website tempat mba beli tiket singapore zoo onlinenya?? Hai Rosa, aku beli di website nya Singapore Zoo langsung. 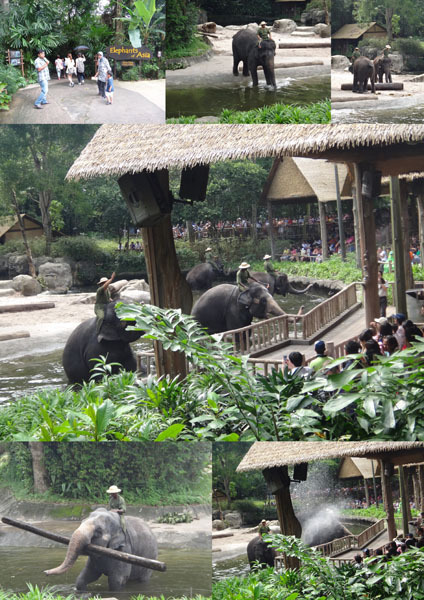 Bisa di googling aja ya "Singapore Zoo"
Bisa banget, secara River Zoo kan sebelahan aja ama Singapore Zoo. Hai mba tesya..kalau dari little india dimana ya mba bisa naik SAEX bus ini ke sing zoo?beli tiket bus nya bagusan online dari web nya atau nanti pas mau naiknya aja mb?trims before..
Hai Mba Niken, aku barusan googling dan ketemu link ini => http://www.bushub.com.sg/_singapore_discovery_centre.html Naiknya dari The Verge Mbak. Beli tiketnya kalau dulu sih aku langsung ke supirnya. Coba aja baca linknya apakah skrg bs online? Have fun ya di Singapura..
Hai Mba Niken, cocok banget itinerarynya..
Saranku pulang dari zoo bisa ke Orchard, kalau Mba pulang naik MRT line merah, lewatin soalnya. Have fun ya di Sin, aku juga ke Sin Oct, tapi tgl 29 pulangnya hehe..